Slender Essense is the answer to all of your prayers. A product that works with the body’s enzymes in order to speed up metabolism and burn fat without any ephedra/ma huang/guarana! Now that we understand the importance that diet plays in regulating our metabolism, we know that a diet high in carbohydrates and low in protein will increase your risk for obesity as well as other insulin-related problems. Is my body producing too much insulin? Am I at risk? There are two very simple things you can do to determine your risk. The first is to take the following quiz. The second thing you can do is determine your Body Mass Index or BMI. This is a chart that lists your height to weight ratio and assigns a corresponding number to it. You can also use the following formula if you are outside the range of the table. Example: for a person who is 65 inches (165 cm) tall weighing 150 lbs (68 kg). 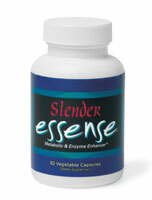 All of the following ingredients are found in the Slender Essense product. Calcium Alpha Ketoglutarate- 400mg. Works with the Kreb’s cycle, produces ATP, increases endurance and stamina. Rhodiola Rosea- 250mg. This standardized extract (3% rosavin, 1.5% salidroside) increases energy (adaptagen), blocks cortisol and acts as an appetite suppressant. Coleus Forskohlii- 250mg. This standardized extract (20%) produces ATP which burns fat, stimulates the thyroid to produce weight loss. Caffeine- 200mg. Produces energy and burns fat. Octopamine HCL- 100mg. Mobilizes fat so it can be burned (citrus-based), acts as a slight appetite suppressant and stimulant. Alpha Lipoic Acid- 100mg. Insulin potentiator which utilizes fats, moderates blood sugar levels, may be effective in treating Parkinson’s, generating energy, protects the liver from alcohol damage as well as the lungs from smoke damage. Protease AO- (Aspergillus Oryzae) 30,000 HUT units. Breaks down proteins into simple amino acids, stimulates the immune system, supports the liver and reduces spicules, separates red blood cells (protein linkage, rouleau, erythrocyte aggregation). Lipase AN- (Aspergillus Niger) 1,280 FIP units. Breaks down fat molecules or tryglycerides into three simple fatty acids.